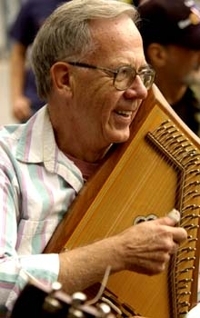 Having been enthused by Grand Master Kilby Snow and Mike Seeger after picking up an autoharp in 1967, Drew Smith went on to become a two-time winner of Winfield International Autoharp Championship, continuing with several other championship awards over the years. In 2002, Drew was inducted into the Autoharp Hall of Fame and in 2011, he was presented with his Lifetime Achievement Award by the California Autoharp Gathering. Drew is a veteran performer and workshop leader, who developed a unique thumb lead style of playing capturing melody notes of fast fiddle tunes on his autoharp. He loves to play the chromatic autoharp, because it gives him the needed notes and chords to be able to play the wide world of music that simply eludes more limited diatonic harps. As a 27 year band member with Roger Sprung & the Progressive Bluegrassers, he has performed throughout the northeast of the USA With other Old-Time band members, Drew has been part of a prize winning group called Ben Borscht and the Beats. In the New York/New Jersey area he regularly performs with his groups: Double Play! and Triple Play All-Stars. You are as likely to hear Drew strike up a Russian tango as a Blues or a Dixieland tune from the 20s as well as Old Time tunes. He teaches many of these tunes at his workshops. He says no matter where it comes from, if you like it, why not play it! Drew is a legend in the Autoharp world.